This yummy candy cane dessert is not only easy to make and super festive for the Christmas season, but it’s super easy to make too! 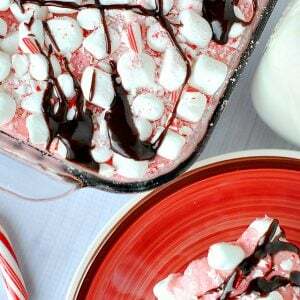 Your family will love this peppermint marshmallow mixture on top of chewy brownies! Bake your brownies following the instructions for the mix to be baked in the 8 by 8 pan. This will give you a nice thick layer of brownies to work with. Allow your brownies to cool. Make the frosting-mix the butter, powdered sugar, milk and peppermint. You may need to add a little more powdered sugar or a little more milk to get the right consistency. Add the marshmallow fluff. Spread on your cooled brownies. Sprinkle with candy cane and marshmallows.